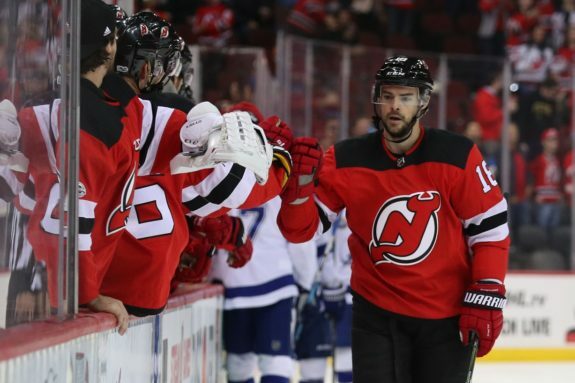 With just two preseason games left to play — starting tonight against the Winnipeg Jets — the New Jersey Devils’ opening night roster is beginning to take shape. Their training camp roster now stands at 28, after a round of cuts over the last two days. However, there are still a couple of decisions to make before Tuesday’s 23-man roster deadline. Have Quenneville & Seney Earned NHL Spots? While their places are not yet guaranteed, John Quenneville and Brett Seney seem to be in good spots to make the 23-man roster. Quenneville’s had a solid training camp and preseason. Through three games, he has a goal, seven shots on net, and three individual scoring chances. At five-on-five, he’s recorded a 51.79% Corsi For (CF%) and has broken even in scoring chances when on the ice. Quenneville figures to fit in the Devils middle-six, where they hope he can add some offense. He had an injury-plagued 2017-18 but produced at a 60-point pace in the AHL. He will probably get some power play time, which should help his point totals. If he can finish with 30-40 points, the Devils will benefit from it. While Seney is in a good position, he still has some work to do. He has four scoring chances and two high-danger chances but hasn’t recorded a point. His shot rates haven’t been as good as Quenneville’s, either. He has a 43.86 CF%, and the Devils have been out-chanced 15-13 with him on the ice. If Seney isn’t guaranteed a spot, he may be sent to the AHL to earn regular playing time. He’s shown promise since turning pro last spring, where he had eight points in 12 AHL games. He’s also impressed since the team’s development camp in July. It may not take long for him to return to the big club if he begins the season in the minors. Will Ty Smith Make the Team? The buzz building around Ty Smith since development camp has been more than warranted. In two preseason games, he’s averaged 19:52 minutes of ice time a game, which is the fifth most of any player on the Devils. He’s seen top-pair minutes, as well as some time on the power play. At five-on-five, Smith’s numbers could use some improvement. He has a 43.86% CF%, and the Devils have been out-chanced 20-10 with him on the ice. If he makes the team, he won’t be playing top-pair minutes. But those numbers will have to be better for him to be a regular in the lineup. Despite the poor five-on-five numbers, Smith has shown flashes of what makes him a top prospect. He’s sound in his own end, makes good decisions with the puck, and has offensive ability. I can see why the Devils would want to keep him around. At the same time, they have to think about his long-term development. 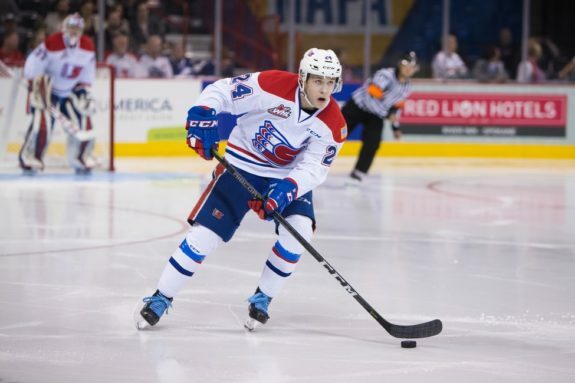 If they don’t think he’s ready to handle a full 82-game season, it may be in his best interest to return to the Spokane Chiefs of the WHL. The Devils are allowed to play him in nine regular season games before burning a year off his entry-level contract. That may be the next step to see how the organization handles his development. Neither Kevin Rooney or Drew Stafford are household names, but they can’t be forgotten, either. 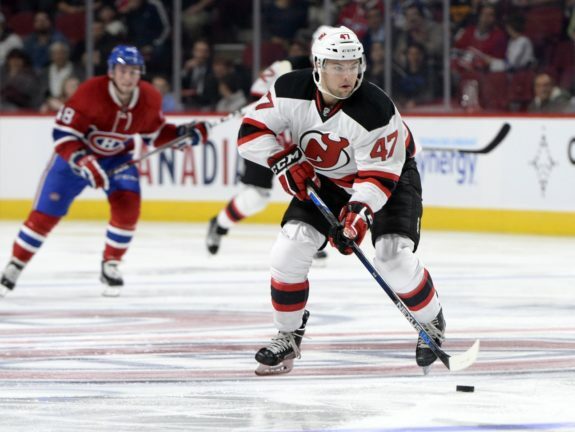 Stafford played in 58 games for the Devils last season and finished with eight goals and 15 points. He remains with the team on a professional tryout and could land a role as a depth player. Rooney — like Stafford — is familiar with the organization. The 25-year-old spent the last three seasons with the Devils’ AHL affiliate and has been one of their top penalty killers. He’s also had a cup of coffee in the NHL, with five games played over the last two seasons. Stafford and Rooney may be at different points in their careers, but they’re both in similar positions. If the Devils don’t think Quenneville or Seney can log regular minutes, that’s where they can factor into the team’s final decision. Rooney can play fourth-line minutes and help out on the penalty kill if the Devils feel they need it. Stafford won’t see much time on special teams, but he can play bottom-six minutes and is pretty useful in the shootout. Those reasons could make both him and Rooney better options than having Seney or Quenneville sit out and not earn regular ice time they need at their age. Aside from a couple of losses, the Devils are returning most of their key players from last season. Their top-nine forwards should look almost the same, as is the case for their top-four defensemen. That should help Devils head coach John Hynes in making his final determinations. His main decisions will be filling out depth roles, where players like Stafford, Seney, and Smith could play. It won’t be any different for Quenneville, who already got a look on the team’s third line during yesterday’s practice. Knowing who will play on your top lines will make filling out depth roles easier. And that could help the team find the right chemistry early in the season.